This page is about the American premium tank M5A1 (5th arm.div.). For the regular version, see M5A1. The M5A1 Stuart (5th Canadian Armored Division) is a gift Rank II American light tank with a battle rating of 2.3 (AB/RB/SB). It was introduced in Update 1.70.1945 "Weapons of Victory". 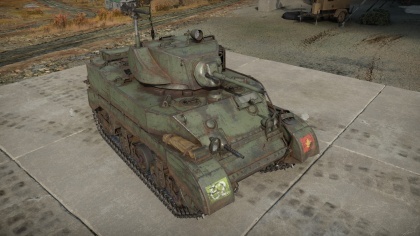 Essentially a gift version of the M5A1 Stuart, its cost was $9.99 in the Gaijin Store, but has since been removed and is no longer obtainable. Ammo rack of the M5A1 Stuart. 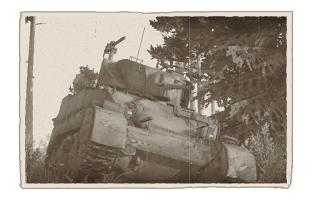 Like all early American tanks in early ranks, this tank works best from a distance where its armour can shine and its gun can provide fast covering fire. However, this tank also works well in tight spaces if the armour is angled correctly, thanks to is ability to bounce shots and snipe enemy crew with its AP ammunition. When fighting against 1.3 to 2.3 BR tanks, use your tank offensively. Push to the cap and hold it, peak out and aim for gunners, then finish them off. the biggest threat to you in this bracket is the SPAA and Tank Destroyers, as both can quickly destroy you. When fighting SPAA, peak and kill their gunner as fast as possible. Do not wait for him to come to you, get him when he isn't expecting it. Tank destroyers are similar, if you can get a shot when he can't aim at you, take it. There are always times when you get uptiered to 3.3 and start facing the long 75mm guns of Germany and Japan. Don't let that stop you from topping the leader board. Use your superior speed to get to the cap before anyone else and take it. Be mindful of artillery but don't expose yourself just to get out of it's range. Remain in or close to the cap until you can see the enemy tanks approaching. On maps like Novorossiysk where you can hide in the park's capture point without being seen, watch for the enemy mediums to leave the urban area. That is your chance, peak and aim for gunners. if there is more than one, change your position and cripple as many as you can, then finish off anyone who hasn't retreated. By now your mediums will have arrived, so you can play more aggressively. Flank them hard and hit them from behind. Be sure not to be surprised by SPAA, because at this BR they will kill you in a heartbeat. In battle matches it's best to flank them. Head around as far away from the usual battle sites as possible and then hit them from behind. A good surprise attack from the rear could get you as much as 4-5 kills in less than a minute. Always remember that your armour can bounce low velocity shots, but don't rely on it. most tanks can and will penetrate your upper glacis. Armour is mediocre but is good. 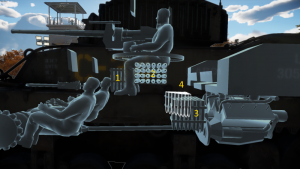 Gun can penetrate most tanks it faces. Crew of 4, only 1 spare crew member. The British were the first to use the M3 Stuart in Africa in 1941, using it in Operation Crusader. However, the result ended with heavy losses, due to the better training the German Afrika Korps had compared to the British tank doctrine. The encounter also pointed out many flaws in the Stuart, mainly the cramped interior and limited operational range, but was praised for its high mobility and reliability when compared to the British contemporary designs. In 1942, the Stuarts were generally kept as recon units rather than combat units, and some were even modified to improve speed and range by removing the turret, and others were converted to armoured personnel carriers and command vehicles. Though the British used it extensively, it was still in small proportion compared to the American usage. The Soviet Union was also another user of the Stuart tanks, but found it unfavorable due to their own logistics, plus it was not made to withstand the Russian Rasputitsa or even the winter. The Soviet eventually turned down any more offers for the Stuart by 1943. The Canadians also used it in their armoured force, such as in the 5th Canadian Armoured Division that served at Italy in 1943 and Belgium in 1945 against the Axis Forces. The Stuarts also supported the British and Chinese forces in Asia against the Japanese Army, and also France and Yugoslavia in Europe against the German Wehrmacht.